Provide the ultimate gift of giving and contribute a little of your time and your heart to be a Companion visitor for patients on Compassus Hospice. Companion volunteers visit with patients and engage in activities of the patient's choice, such as reading, going outside, reminiscing, playing cards or just chatting. For many patients, companionship at the end of life is vital. 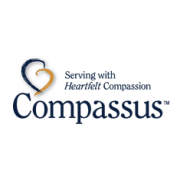 If you feel called to be present for someone in this manner and support them on their journey, please call Kim Iannacci at 978 777-8222 or email at Kimberly.Iannacci@compassus.com. You can make a difference in someone's life at the end of life!